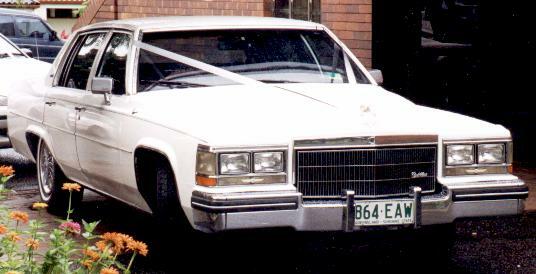 My 'daily driver' is a 1984 Cadillac Sedan deVille. Perhaps the ultimate 'creature comfort' machine of its day, and still able to compete head on with luxury cars of 1999, it includes such standard features as six-way power seats, power windows, mirrors, trunk open/pull down, digital fuel injection, electronic level control, push-button electronic climate control, heated rear window and rearview mirrors, cruise control, twilight sentinel automatic headlights and on-board computer diagnostics. Colour scheme is Cotillon White with Dark Carmine leather upholstery. Fuel consumption around the city averages out at around 16l/100km or 17.5mpg. Not bad for nearly 2 tonnes of sheer luxury. Youngest daughter Gwen was instrumental in convincing me that the Caddy would fit in our garage by producing rather accurate measurements. Gwen was, as usual, correct. There is around three inches (7.5cm) clearance either side between the garage door pillars and the side mirrors. One inch (2.5cm) between the front bumper and the rear of the garage, and 12 inches between the rear bumper and the closed garage door. As it is a double garage, there is sufficient room to open the doors to enter/exit the car once it is parked.